We follow the redemption of the book of Exodus right into the service- and worship, of Leviticus. After salvation (redemption) we are called to live lives of service and worship (Leviticus). We are called to be Holy. 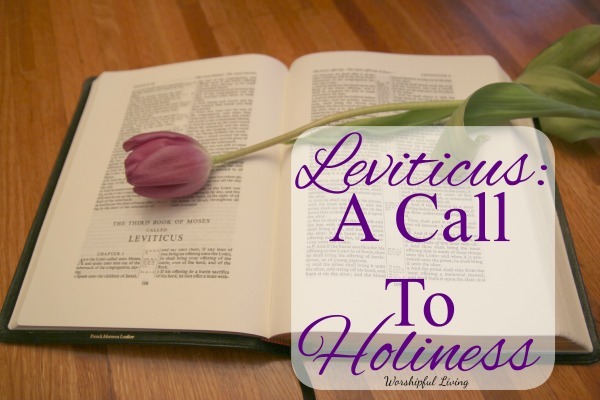 The very word holy, as used in Leviticus, means that which is set apart and marked off, that which is different.” (Warren W. Wiersbe in the “Be Holy” book on Leviticus) We are called to be set apart. The question is, how? We must deal with Sin – Leviticus opens by giving instruction for offering sacrifice – no matter what the sacrifice, it had to be perfect, representing the perfect sacrifice of Jesus Christ. True worship begins as we confess our sins and accept Christ- the only one who can redeem us from sin. Even after salvation, it is important to keep our sin records short- making sure we confess our sins and turn from them – to go, and sin no more. Celebration- Our world does not celebrate conformity, unless it is to its own standards However, God calls us to conform to the image of Christ. This is the sanctification process- this is holiness! Sanctification is the process of becoming like Christ- the result is our holiness. Leviticus calls us to celebrate this process- and the result! This book talks about the feast times- of remembering what the Lord has done. We, too need to have times of remembrance- seasons of celebrating the work of God in our lives. These may come as holidays or traditions as they did for the nation of Israel, or personal moments in our daily walk. Here are just a few more of the thoughts about the Priesthood, how we are New Testament Priest (and how that affects our holiness). I also give a short syllabus of the book of Leviticus. If you can’t see this video, click here. Because of this, we know we can find Jesus written on the pages of Leviticus. Maybe it is for those reasons that so many struggle through Leviticus’ pages. It is because the concept of holiness is so hard – not just the words. Join me, as we dive deep and I do mean deep, and work out our faith. In one of the hardest, yet most important books- and topics- in all of scripture. You will be able to find the rest of the study on this page as the links become available. I loved your video Mandy!! I am really looking forward to our study in Leviticus with the Good Morning Girls! Nice introductionvideo! Had to share on the norwegian goodmorninggirls facebookpage. Hope you don’t mind! Thanks. Catherine- of course not! 🙂 Please feel free to share any resources from Good Morning Girls with your girls! Thank you SO much Mandy,I gravitated over after seeing your video on Good Morning Girls, and I’m so thankful that you write this blog. I wasn’t exactly sure what I’d get from Leviticus, but now I’m excited. I am so glad Jenny! I plan on trying to blog through every chapter or two – so I hope there will be LOTS here to give you encouragement! This is a new study for me. I was introduced to your website by a dear friend as a way to study Gods word from home. Thank you for the site. I’am so excited to get started. Welcome Claudia! We do our best to keep the Word of God at the forefront! <3 Blessings!